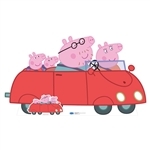 Bring the wonderful endearing world of Peppa Pig, her friends and family into your customer offering. Peppa has a multitude of adventures, some with tears, most with laughs. With these Peppa Pig party cardboard cutouts and masks you can recreate her childish enthusiasm amongst your guests. With this range of mini cutouts and amazing child size stand in you are sure to find the perfect accessories for your event. Each cutout has been approved by Entertainment One so you can be assured of high quality product. All Peppa Pig cardboard party supplies arrive folded for easy transportation and storage. Each has a cardboard easel on its revers making it free standing. If you would prefer your cut out created on Foamex for outdoor use contact our friendly helpful team.